Daytona Beach, well known for its spring break party scene, Daytona Beach, Florida has something to offer every traveler, any time of year. Dayton Beach has so many attractions and activities, it hard to find time to fit them all in one vacation. Embark on an aquatic adventure; we suggest parasailing, kayaking or a banana boat ride on the pristine waters of the Atlantic Ocean. If you have a need for speed, check out the Daytona 500 Experience, or for a historical experience, visit one of the areas many historical sites and ruins. 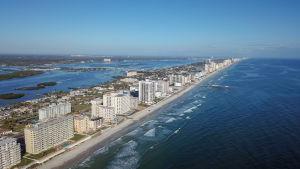 There are hundreds of lodging options available for your Daytona Beach vacation, a family-friendly resort or a romantic bed & breakfast; Daytona Beach has accommodations for every need under the sun. After an action-packed day of adventure, we recommend treating yourselves to an up-scale dining experience at The Cellar Restaurant. This local treasure was built in 1907 and was the former residence of President Warren G. Harding. If you prefer dining in a beach towel and flip flops, try one of the areas casual beach front eateries. Daytona Beach is home to more than 400 restaurants, so you’ll be sure to find something to satisfy your craving. Need a little excitement after a relaxing day at the beach, check out the Daytona Beach Night-life. From beach bars to blues bars, Daytona Beach has them all. 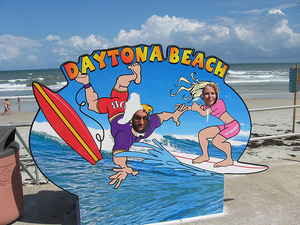 No matter what your age or pleasure, a Daytona Beach vacation will be one to remember. 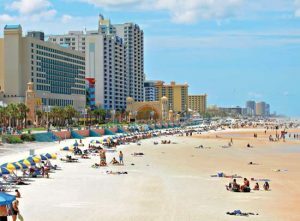 Daytona Beach is a city on Florida’s Atlantic coast. It’s known for Daytona International Speedway, which hosts February’s iconic Daytona 500 NASCAR race. The beach has hard-packed sand where driving is permitted in designated areas. Near the boardwalk’s rides and arcades, Daytona Beach Bandshell stages free summer concerts. Steps from the beach, Daytona Lagoon water park offers go-karts, laser tag and waterslides.. Although Daytona Beach used to be known as the Spring Break Capital, the local residents have gone to great lengths to make the area less MTV-friendly. The result is a family-friendly beach town that’s rarely overcrowded, with the exception of Bike Week once a year. Daytona Beach is a great place for Floridians to escape for a relaxing family weekend, even when the weather gets too cold for the beach. Take in the NASCAR scene, play a round of mini-golf, and watch the kids take aim at one in another in a game of laser tag! The Daytona Beach pier is great for fishing or just taking a walk. What makes fishing here so great is the ability to get into the deeper waters of the Atlantic Ocean without having to pay for a charter boat. You will have to pay a fee to get beyond the restaurant, however, out onto the long part of the pier. You can also pay to ride the rickety-looking seats suspended by a cable that go out to the end of the pier and back; my children assure me it is perfectly safe. 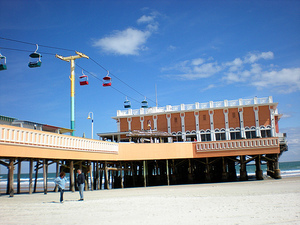 The Boardwalk is lined with little shops, tattoo parlors, arcades and food stands. On any given weekend, you might also stumble on a surfing competition or a local festival. One weekend we found an international VW bus convention and exhibition was being hosted on the Boardwalk, which made from some great afternoon sightseeing and photo ops. The Boardwalks is just a great place to wander and explore and let the kids get some fresh air as they run a few steps ahead of you. Get a day pass for the Daytona Lagoon Water Park and you’ll be able to do so much more than water slide (although, yes, there are those, too). 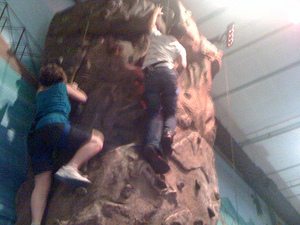 Spend your quarters at the indoor arcade, race other family members up the rock wall (which is safer than it sounds), and take on a team of total strangers in a game of laser tag. You can also play against one another, but be prepared for bad attitudes if one sibling is noticeably better than another. The Lagoon also has a two-level go-kart track and mini-golf course. 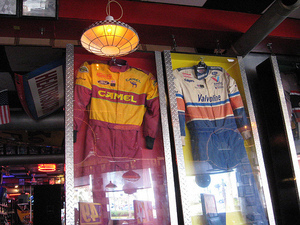 It’s not hard to find a good burger in Daytona Beach, but this is the only place where you can enjoy it surrounded by racing memorabilia. The walls are covered from floor to ceiling with photos, patches, race suits and other souvenirs of speed. Study the walls and you might learn something about the history of racing in Daytona Beach or find a photo of your favourite driver. A place to eat that provides things to look at is always a great option with kids. The Daytona beach Area’s culinary scene is loaded with delectable dinning options. You’ll find both locally owned eateries and familiar favorites. For a unique distinct dinning experience, try one of our many locally owned dining spots that dot or downtown districts in Daytona Beach (Beach Street), Ormind Beach (Granada Boulevard) and New Smyrna Beach (Canal Street). Waterfront dining is prevalent throughout the area. waterfront dining not only allows you to enjoy a delicious meal, but also beautiful river and ocean views. Popular waterfront restaurants include the Ocean Deck restaurant & Beach Club, SW Grill at Sunset Harbor, Chart House, Joe’s Crab Shack at the Daytona Beach Pier, racing’s North Turn, Inlet Harbor Restaurant & Marina, Crabby Joe’s Deck & Grill, Our Deck Down Under, Azzure at The Shores Resort $ Spa, and Hyde Park Prime Steakhouse at the Hilton Daytona Beach resort, to name a few. Daytona Flea & Farmers market. Voted one of he top five markets by USA Weekend, you will be amazed by this market’s many offerings, from fresh produce and seafood to art, clothing, electronic, Jewelry and much more! 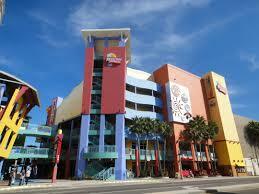 Ocean Walk Shoppes, Looking for beach and resort wear? Then a stop here is a must. This oceanfront, multi-level, outdoor shopping plaza is home to Maui Nix, Point Break, Caribongo’s and Sunglass Hunt. The Pavillion at Port Orange. Major retailers housed in this outdoor shopping Village include Belk, Marshall/HomeGoods Megastore and ULTA. The Pavillion also features a variety of specialty stores and boutiques. The Trails Shopping Center. Located in Ormond Beach, major retailers such as Ann Taylor Loft, Talbot’s, Jos. A. Bank, Coldwater Creek, Patchington, Chico’s and White House Black Market call this shopping center home. Volusa Mall. You”ll find more than 125 retail stores here, including Macy’s JCPenney, Dilards, Abercrombie & Fitch, Charlotte Russe, Aeropostale and American Eagle Outfitters. CLICK HERE TO GET BACK TO THE HOME PAGE!